* Review and Summary may contain spoilers from the previous books of the series. It seems like years and years have past while I have been awaiting the release of this book. Oh, wait… it was. And was the wait worth it? Abso-freakin-lutely. Bitterblue was exactly what I wanted it to be. 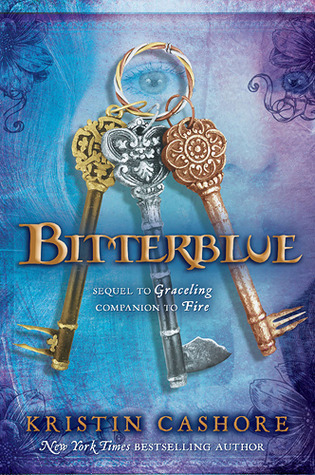 Bitterblue, now a Queen in her own right, is trying desperately to piece together her Kingdom. Lies, betrayal, and secrets haunt Monsea. Queen Bitterblue's legacy is tarnished with the memories of her father and all that King Leck has done. All that's left is trying to piece Monsea back together and wade through the mess. What I love about Kristin Cashore is that none of her heroines are exactly the same. Katsa, Fire, Bitterblue all have that same spark, but there is very distinct differences between each one. Although it is hard to pick a favorite, there is a special place in my heart for Bitterblue and everything that she has gone through. Bitterblue was a fantastic addition to this series. While every little detail is not wrapped with a bow, it was wonderful to see some details come full circle. Trust me when I say that I am trying to kept this spoiler-ish free, but I loved getting to see some of my favorite characters coming back from previous novels. I will not name names, but quite a few and their story arcs were a surprise. Kristin Cashore is a gifted writer, who knows how to please.